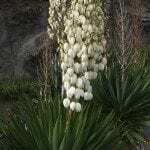 Once the yucca is cut, should anything be put on the remaining stalk to avoid rotting of the plant? No, you do not need to add anything to the cut. It is best to leave it to heal on its own.